Corrosion is a chemical reaction phenomenon that results in degradation of material and can lead to serious or catastrophic failures. Corrosion investigation engineering is the process of collecting and analyzing corrosion failures to determine the source (root cause) of the corrosion, severity of the corrosion and provide expert opinions and recommendations for corrosion remediation and prevention. MTi specializes in corrosion investigation engineering and the analytical techniques used to identify corrosion mechanisms. We have the expertise to recommend more corrosion resistant alloys or coatings for a particular application or environment to prevent recurrent corrosion issues. Our Energy Dispersive x-ray Spectrographic system (EDS) is capable of analyzing corrosion deposits to identify the corrosive agent. MTi also has the expertise and capabilities to offer accelerated Salt Fog and other corrosion testing to determine the suitability of materials and coatings for specific environments. Carbon steel pipe fittings from a fire suppression system corroded due to micro-biologically influenced corrosion (MIC), most likely due to anaerobic sulfate reducing bacteria. Structures that appear to be tubercles (i.e. hollow mounds of corrosion product and deposits that cap localized regions of metal loss) form due to oxygen concentration cells. 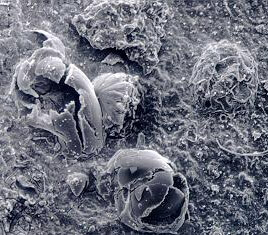 The oxygen gradient inside tubercles can lead to the formation of anaerobic conditions and colonization by sulfate reducing bacteria. Tubercles generally have shallow dish shaped depressions caused by corrosion of the base metal. However, when sulfate reducing bacteria are present, deep discrete hemispherical pits form. 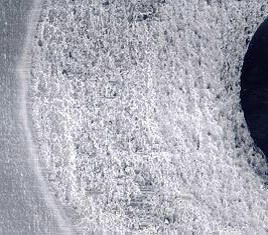 A SEM/BSE image of a corrosion pit associated with stress corrosion cracking in a stainless steel drum. The Back Scatter Electron (BSE) imaging mode of the Scanning Electron Microscope is sensitive to compositional variations. The corrosion products appear dark with the stainless steel base metal appearing white. 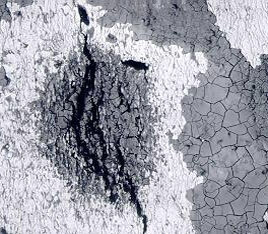 SEM/EDS analysis indicated a high concentration of chlorides in the corrosion deposit.